Yes, this is my 300th post and Roti n Rice turns 2 on December 31st! How time flies! It is hard to believe that it has been almost 2 years since I published my first post. Many thanks for your continued support and encouragement. I could not have done it without YOU. Your valuable feedback and comments keep me going. THANK YOU! For today’s post, I have decided to share this Cream of Kabocha and Wild Rice Soup with you. As much as I like roti (bread) and rice, soup makes my heart sing, especially during the cold Minnesotan winters. There is nothing like a nutritious bowl of soup to warm the body and soul. While we drink a lot of clear soups, I like to make a creamy soup every now and then to accompany a “Western” meal. I made this soup as a starter for our Thanksgiving dinner. A very popular soup here is Minnesota Wild Rice Soup. Wild rice is after all Minnesota’s State Grain. It is actually a grain and not a rice at all. Highly nutritious, it is naturally abundant in the cold rivers and lakes of Minnesota and Canada and is the staple in the diet of the Chippewa and Sioux Indians, native to this region. To read more please click here. August through September is the usual harvest time for wild rice. I buy a bag or two each year as they are plentiful in the stores. I use it in turkey stuffing, salads, and soups. They also make great basket stuffers in gift baskets. 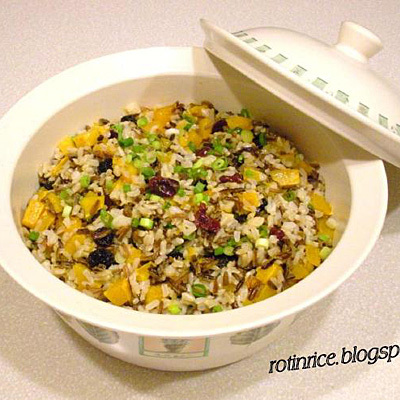 Do check out the other two recipes using wild rice on this blog. Simply click on the picture to get to the recipe. I hope you enjoy this soup. I used my favorite kabocha squash but you can use pumpkin or butternut squash if you prefer. Serve warm with crackers or crusty bread. I am linking this to Friday Soup Blog Hop hosted by the lovely Katherine Martinelli. Congratulation on your 300th posts and happy 2 years old blogging anniversary. Lovely presentation and photos. Have a nice day. 300 posts, that’s amazing!! congreats, here is to many more!! Wow, 300 posts!!! All amazing. This soup looks SO good. I think I will make this soon. We don’t have kabocha squash here that I’ve seen but I’ll substitute butternut squash or pumpkin as you suggested. Congratulations on your 300th posts. Congrats ! more good posts to come..this soup look so comfort and yummy. Hey Biren – Congrats on 300!!! Woo hoooo! My goodness, can’t imagine chalking in three hundred posts myself now – so much work! Well done GF. Congratulations on your 300 post and almost 2 years of blogging! Wish you many more to come! your recipes and photos are great! Oh Brien, this looks so good. With colds racing through everyone in the house, a healthy pot of soup sounds perfect. I’m a fan of wild rice in soup because it doesn’t get mushy or look like maggots (I know, gross, but that’s how my mind works), so this would be perfect for me. Congratulations both on the 2-year anniversary coming up and on this 300th post! I’m glad I found your blog because I have learned so, so much from you! Congrats on two wonderful years!! What a beautiful meal! Congratulations Biren, 300 posts is a milestone! What a wonderful recipe to celebrate your 300th post! Congrats on 300. That is quite a feat and amazing. You always share the most fantastic recipes and pictures with us! So glad to have found your site! The soup looks fabulous and I love the added wild rice. Your Cream of Kabocha and Wild Rice Soup is stunning as always! Congratulations on your 300th post and on your blog’s 2nd anniversary! Way to go, Biren! More power to you and your blog! What a comforting looking soup! I love it that you added some wild rice, reminds me of my favourite barley soup :). Congrats on the 300th post, looking forward to seeing more beautiful posts over here :D)!! Congratulations on your 300th post!!! This is amazing and your lovely blog is turning 2! What a great month for you Biren! It’s going to be a big celebration month for you!! I love your kabocha soup. Adding wild rice is very interesting. So we can consider that as one meal like porridge… no? Heheh. Have a wonderful weekend Biren! Do you know the great recipe for a successful Two years and 300 posts? Well, I just mentioned it. It is your great recipe, Biren! 🙂 Congratulations, my friend! 300th post! That is so amazing! Congrats! This dish looks delicious! Bravo on such a milestone – or rather, milestones! Fabulous going and what a way to celebrate with this soup. I love the addition of wild rice, Biren. Sounds and looks amazing. What a great soup, perfect for the cold weather! I think I never bough wild rice because I am not sure what to do with it, putting it in soups sounds like a great idea! Your kabocha squash soup recipe is good on its own, but the addition of the wild rice certainly turns a good thing great! I love wild rice and will be checking out your other recipes. Great post! The soup looks very comforting! Congratulations on your 300th post! Congratulations on 2 years of blogging Biren! The soup is so hearty and comforting! I don’t use wild rice often enough in my cooking – even though I have it in my cupboard. Wishing you another great year of blogging! THANK YOU all for your kind words and congratulatory messages. It is much appreciated! This is completely new to me & the dishes look so yummy! Great for entertaining guests as well. 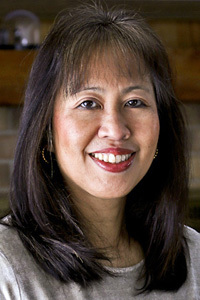 Biren, would really love to have you try out my recipes & join me @ Promote Your Blog @ Shirley’s Luxury Haven! DIY This X’mas With 12 Lovely Recipes! Happy Holidays! I did not know that wild rice is Minnesota ‘s State grain! I have said it at FB but it does not matter to say it again – congrats on your 300th and happy blogversary! Congratulations on your 2nd blogversary and 300th post. Your soup looks very delicious and nutritious, too. Wow, this soup is fantastic! I had Blue Kuri squash, so I used that instead. And I fried up 3 slices of bacon, and then sauteed the veggies in the bacon grease. This soup is a winner! Thanks for posting the wonderful recipe! What a beautiful soup! And a huge congratulations on your 300th post as well as your upcoming anniversary! I am hungry right now. I read your recipes and make me excited to cook at when I got home. It finds me more delicious. Even if I don’t follow your recipes exactly, they always inspire me to make something delicious. Thank you, Biren. And congratulations on your 300th post. It’s a lot of work, but very much appreciated by all of us.